El Dorado is proud of all our artistically talented students. Here are some who were recently recognized for their accomplishments. 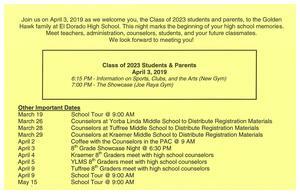 On Wednesday April 3, EDHS will host our annual 8th Grade Showcase from 6-8pm.